The 2030 Agenda on Sustainable Development offers a unique framework for transformative pathways towards sustainability worldwide. The 2030 Agenda also requires a paradigm shift in governance, – at and between all levels. 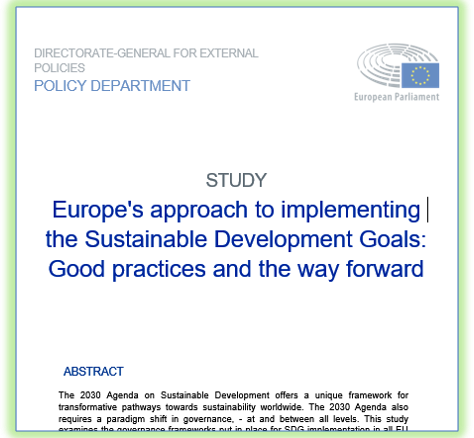 This study examines the governance frameworks put in place for SDG implementation in all EU Member States, and the resulting country fiches constitute the first comprehensive comparative overview of these. The study also provides an overview of the developments at EU level and has a special focus on the role of parliaments in implementing Agenda 2030. Our analysis shows that EU Member States are integrating SDGs into national strategies. While Member States have taken steps to enhance horizontal policy coordination, there is a continuing need for better mainstreaming sustainability. Member States innovate with SDG budgeting, science-policy interface, and stakeholder participation mechanisms for making these strategies more operational. Parliaments show increasing activity on the SDGs and the EP could benefit from enhanced collaboration. The EU could learn from and support these initiatives. Dynamising the multi-level governance bears a great potential for sustainable progress for all players and is a requisite to accelerate SDG implementation at all levels. By capturing the two-level character of SDG implementation at the EU and the Member State level, the study contributes to an overarching joint voluntary EU report at the HLPF 2019.